UNITED NATIONS, January 6 -- As the UN and Security Council engage in happy talk about the South Sudan referendum, events in Darfur get worse and worse. On January 6 Inner City Press put questions to the UN Permanent Representatives of the US and Sudan, and to the UN itself. On background, a number of Council sources said that the African Union - UN Hybrid Operation in Darfur is not pushing hard enough for access to civilians in harm's way. But the focus is on the referendum. Inner City Press: this agreement by Salva Kiir to eject or stop the rebel groups from Darfur from being in South Sudan. Is it a positive thing? Does it help resolve things in Darfur, the idea that they wouldn't have to go back? It was announced by Salva Kiir. Ambassador Rice: Our view has long been that it's vitally important that both parties to the CPA refrain from, in any way, direct or indirectly supporting rebel or proxy activity against the other. And so we urged that, to the extent that that has been the case, that it cease. Inner City Press: yesterday during a background briefing, a senior [UN] official said — about Sudan — said of Sudan that there had been, during the fighting in Khor Abeche in Darfur, that a Tanzanian battalion had fed IDPs [internally displaced persons] with their own rations and had been unable to be re-supplied due to Government restrictions on the re-supplying, it seemed to be, of the peacekeepers. Can you confirm that there was a time during that fighting that even the UN peacekeepers were unable to get their supplies in? And if so, was that ever said publicly, and — it seems like in other countries, they complained when its peacekeepers were being in any way blockaded. Did that take place in Khor Abeche, as it seemed to be said yesterday? But seven hours later there was no answer. Inner City Press asked Sudan's Permanent Representative about Khor Abeche, if Sudan had blocked resupply of peacekeepers. 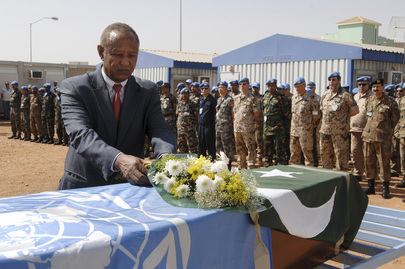 The Sudanese Ambassador again offered praise for UNAMID, then said that when there is fighting, movement is restricted for the peacekeepers' own good. 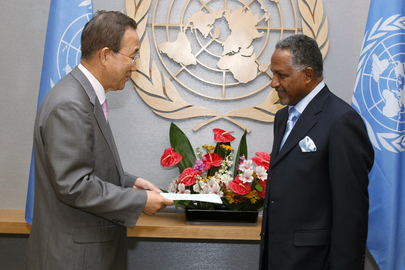 While top UN peaceekeeper Alain Le Roy had told the press that he requested a boost in UN troop levels but Sudan would not agree, Sudan's Ambassador said he was in a meeting with Le Roy on January 5 and Le Roy made no such request. The UN should clarify this. Inner City Press asked asked Sudan's Ambassador about the allegations by International Criminal Court prosecutor Luis Moreno Ocampo that Omar al Bashir spirited $9 billion out of the country. He replied it was ridiculous, that Lloyds had immediately denied it. Inner City Press asked about the meeting on this topic between Ocampo and Susan Rice and Alejandro Wolff at the US Mission to the UN, memorialized in a Wikileaked cable. (Ambassador Rice has twice said she doesn't recall the meeting.) Sudan's Ambassador said this showed that Ocampo was “taking his orders” from sources other than the ICC. We will have more on this.